The scene: day one of a consulting gig with a new client to build a design and code library for a web app. As luck would have it, the client invited me to sit in on a summit of 25 design leaders from across their enterprise planning across platforms and lines of business. The company had just exploded from 30 to over 100 designers. Hundreds more were coming. Divergent product design was everywhere. They dug in to align efforts. From a corner, I listened quietly. I was the new guy, minding my own business, comfortable with my well-defined task and soaking up strategy. Then, after lunch, the VP of Digital Design pulled me into an empty conference room. “Can you refresh me on your scope?” she asked. 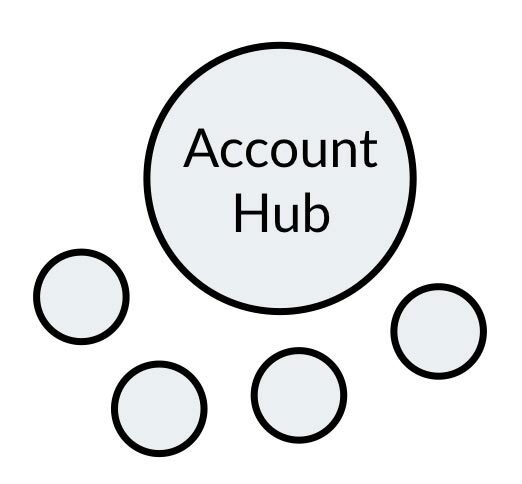 So I drew an account hub on the whiteboard. “See, the thing is…” she responded, standing up and taking my pen. “We’re redesigning our web marketing homepage now.” She added a circle. 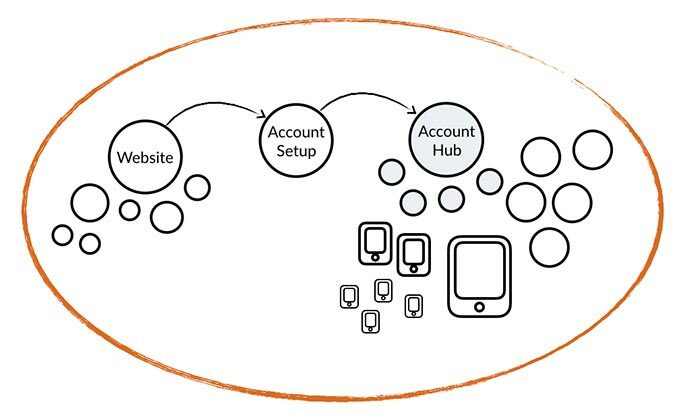 “We’re also reinventing online account setup.” Another circle, then arrows connecting the three areas. “We’ve just launched some iOS apps, and more—plus Android—are coming.” She added more circles, arrows, more circles. A long pause, then a deep breath. Our design system—the parts focused on, the people involved, the products reached—had just grown way more complicated. Our industry is getting really good at surfacing reusable parts in a living style guide: visual language like color and typography, components like buttons and forms, sophisticated layouts, editorial voice and tone, and so on. We’ve also awoken to the challenges of balancing the centralized and federated influence of the people involved. But there’s a third consideration: identifying and prioritizing the market of products our enterprise creates that our system will reach. As a systems team, we need to ask: what products will use our system and how will we involve them? While some enterprises may have an authoritative and up-to-date master list of products, I’ve yet to work with one. There’s usually no more than a loose appreciation of a constantly evolving product portfolio. A simple list is easy enough. Any whiteboard or text file will do. Produce the list quickly by freelisting as many products as you can think of with teammates involved in starting the system. List actual products (“Investor Relations” and “Careers”), not types of products (such as “Corporate Subsites”). Note that because every enterprise is unique, the longer the lists get, the more specific they become. Type / platform: web site, web app, iOS, Android, kiosk, etc. Other metadata (optional): line of business, last redesigned, upcoming redesign, tech platform, etc. Creating such an inventory can feel draining for a designer. 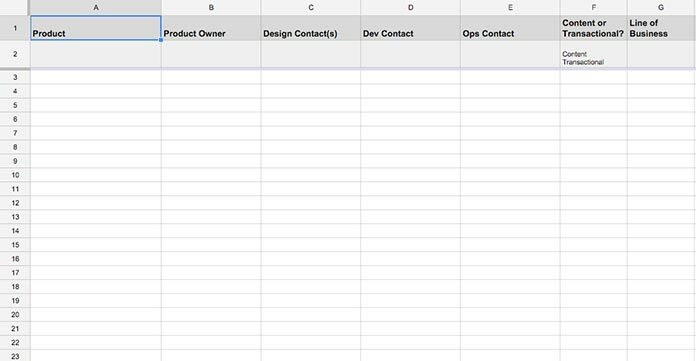 Some modern digital organizations struggle to fill out an inventory like this. I’m talking deer-in-headlights kind of struggling. Completely locked up. Can’t do it. But consider life without it: if you don’t know the possible players, you may set yourself up for failure, or at least a slower road to success. Therefore, take the time to understand the landscape, because the next step is choosing the right products to work with. A system effort is never equally influenced by every product it serves. Instead, the system must know which products matter—and which don’t—and then varyingly engage each in the effort. You can quickly gather input on product priorities from your systems team and/or leaders using techniques like cumulative voting. Your objective is to classify products into tiers, such as Flagship (the few, essential core products), Secondary (additional influential products), and The Rest to orient strategy and clarify objectives. Flagship products are the limited number of core products that a system team deeply and regularly engages with. These products reflect a business’ core essence and values, and their adoption of a system signals the system’s legitimacy. Getting flagship products to participate is essential, but challenging. Each usually has a lot of individual power and operates autonomously. Getting flagships to share and realize a cohesive objective requires effort. When naming flagships, you must believe they’ll play nice and deliver using the system. Expect to work to align flagships: they can be established, complicated, and well aware of their flagship status. Nevertheless, if all flagships deliver using the system, the system is an unassailable standard. If any avoid or obstruct the system, the system lacks legitimacy. Takeaway: obtain firm commitments, such as “We will ship with the system by such and such a date” or “Our product MVP must use this design system.” A looser “Yes, we’ll probably adopt what we can” lacks specificity and fidelity. Flagship commitment can surface as a part of a massive redesign, corporate rebranding, or executive decree. Those are easy events to organize around. Without one, you’ll need to work harder bottom-up to align product managers individually. Takeaway: establish a reasonable adoption milestone you can broadcast, after which all flagships have shipped with the system. For a system to succeed, flagships must ship with it. So choose just enough. One flagship makes the system’s goals indistinguishable from its own self-interest. Two products don’t offer enough variety of voices and contexts to matter. Forming a foundation with six or more “equally influential voices” can become chaotic. Takeaway: three flagships is the magic minimum, offering sufficient range and incorporating an influential and sometimes decisive third perspective. Allowing for four or five flagships is feasible but will test a group’s ability to work together fluidly. Enterprises place top talent on flagship products. It would be naive to think that your best and brightest will absorb a system that they don’t influence or create themselves. It’s a team game, and getting all-stars working well together is part of your challenge. Takeaway: integrate flagship designers from the beginning, as you design the system, to inject the right blend of individual styles and shared beliefs. More products—a secondary set— are also important to a system’s success. Such products may not be flagships because they are between major releases (making adoption difficult), not under active development, or even just slightly less valuable. Early systems efforts can explore concept mockups—also known as reference designs—to assess a new visual language across many products. Reference designs reveal an emerging direction and serve as “before and after” roadshow material. Takeaway: include secondary products in early design concepts to acknowledge the value of those products, align the system with their needs, and invite their teams to adopt the system early. Takeaway: be open to—but carefully moderate—the involvement of designers on secondary products. The bigger the enterprise, the longer and more heterogeneous the long tail of other products that could ultimately adopt the system. A system’s success is all about how you define and message it. For example, adopting the core visual style might be expected, but perhaps rigorous navigational integration and ironclad component consistency aren’t goals. Documentation may be your primary—or only—channel to communicate how to use the system. Beyond that, your budding system team may not have the time for face-to-face meetings or lengthy discussions. Takeaway: early on, limit focus on and engagement with remaining products. As a system matures, gradually invest in lightweight support activities like getting-started sessions, audits, and triaging office-hour clinics. Every product portfolio is different, and thus so is every design system. Let’s consider the themes and dynamics from some archetypal contexts we face repeatedly in our work. 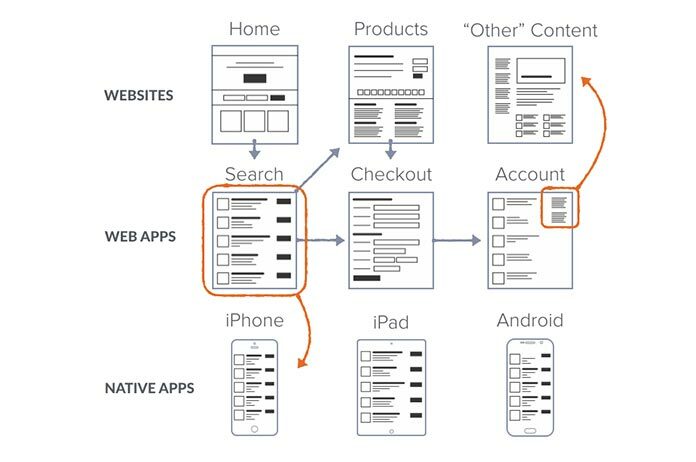 Typical web marketing sitemap, overlaid with a product section team’s choices on spreading a system beyond its own section. System influence usually radiates from Marketing and Brand through to selling Products. 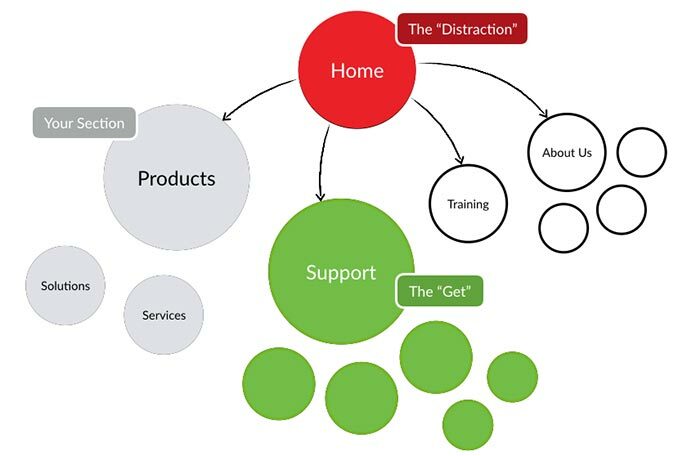 But Support is where customers spend most of their time: billing, admin, downloading, troubleshooting. Support’s features are complicated, with intricate UI and longer release cycles across multiple platforms. It may be the most difficult section to integrate , but it’s essential. Takeaway: if your gets—in this case Home, Products, and Support—deliver, you win. Everyone else will either follow or look bad. That’s your flagship set. Achieving cohesive design is about suffusing an entire experience with it. Yet a homepage is often the part of a site that is most exposed to, and justifiably distinct from, otherwise reusable componentry. It has tons of cooks, unique and often complex parts, and changes frequently. Such qualities— indecisiveness, complexity, and instability—corrode systems efforts. Takeaway: don’t fall prey to the homepage distraction. Focus on stable fundamentals that you can confidently spread. As branding or navigation changes, so does a header. It appears everywhere, and changes to it can be propagated centrally. Get those properties—particularly those lacking full-time design support—to sync with a shared navigation service, and use that hook to open access to the greater goodies your system has to offer. Takeaway: exploit the connection! Adopters may not embrace all your parts, but since you are injecting your code into their environment, they could. A smaller company’s strategic shifts can be chaotic, lending themselves to an unstable environment in which to apply a system. Nevertheless, a smaller community of designers—often a community of practice dispersed across a portfolio—can provide an opportunity to be more cohesive. Many small companies assemble portfolios of websites, web apps, and their iOS, Android, and Windows counterparts. Websites and native apps share little beyond visual style and editorial tone. However, web apps provide a pivot: they can share a far deeper overlap of components and tooling with websites, and their experiences often mirror what’s found on native apps. Takeaway: look for important products whose interests overlap many other products, and radiate influence from there. Diagram of product relationships within a portfolio, with web apps relating to both web sites and native apps. A small company’s flagship products should be the backbone of a customer’s journey, from reach and acquisition through service and loyalty. Design activities that express the system’s value from the broader user journey tend to reveal gaps, identify clunky handoffs, and trigger real discussions around cohesiveness. Takeaway: evoke system aspirations by creating before/after concepts and demoing cohesiveness across the journey, such as with a stitched prototype. For Marriott.com, disparate design artifacts across products (left) were stitched together into an interactive, interconnected prototype (right). Because of their areas of focus, “non-digital” designers (working on products like trade-show booths, print, TV, and retail) tend to be less savvy than their digital counterparts when it comes to interaction. Nonetheless, you’ll share the essence of your visual language with them, such as making sure the system’s primary button doesn’t run afoul of the brand’s blue, and yet provides sufficient contrast for accessibility. Takeaway: encourage non-digital designers to do digital things. Be patient and inclusive, even if their concerns sometimes drift away from what you care about most. For an enterprise as huge as Google, prioritizing apps was essential to Material Design’s success. The Verge ’s “Redesigning Google: How Larry Page Engineered a Beautiful Revolution” suggests strong prioritization, with Search, Maps, Gmail, and later Android central to the emerging system. Not as much in the conversation, perhaps early on? Docs, Drive, Books, Finance. Definitely not SantaTracker. With coverage across a far broader swath of products, ensure flagship product selection spans a few platforms and lines of business. If you want it to apply everywhere, then the system—how it’s designed, developed, and maintained—will benefit from diverse influences. Takeaway: Strive for diverse system contribution and participation in a manner consistent with the products it serves. Massive enterprise systems trigger influence from many visionaries. Yet you can’t rely on senior directors to produce meticulous, thoughtful concepts. Such leaders already direct and manage work across many products. Save them from themselves! Work with them to identify design talent with pockets of time. Even better, ask them to lend a doer they recommend for a month- or weeklong burst. Takeaway: defer to creative leaders on strategy, but redirect their instincts from doing everything to identifying and providing talent. I confess that in the past, I’ve brought a too-lofty ambition to bear on quickly building huge libraries for organizations of many, many designers. Months later, I wondered why our team was still refining the “big three” (color, typography, and iconography) or the “big five” (the big three, plus buttons and forms). Um, what? Given the system’s broad reach, I had to adjust my expectations to be satisfied with what was still a very consequential shift toward cohesiveness. Takeaway: balance ambition for depth with spreading fundamentals wide across a large enterprise, so that everyone shares a core visual language. Approach a design system as you would a marathon, not a sprint. You’re laying the groundwork for an extensive effort. By understanding your organization through its product portfolio, you’ll strengthen a cornerstone—the design system—that will help you achieve a stronger and more cohesive experience. Nathan Curtis is a principal at EightShapes, LLC, a UX design agency he cofounded with Dan Brown in 2006 in Washington, DC. With EightShapes, Nathan has consulted on design systems for clients including Cisco, Marriott, Wells Fargo, Discovery, eBay, NetApp, Capital One, and Yahoo. He has practiced design and front-end development since 1996. This is a solid outlook that translates through web design and resonates at higher levels for companies who offer design as a service. Awesome article Nathan and a good read! Thanks for sharing nice information about promoting a design system. Very interesting however this strategy does not seem simple to implement and is not accessible to everyone! The front line is going to take a shot at compact applications in a manner of speaking. They need to filter the web through compact and get a kick out of the chance to do shopping through an adaptable application. Time passing and these apps will highly prominent. product designing must be proper in any website who is selling online product. representation is most important for every to to sell maximum products. I am an active blogger and I am often to blogging. I really appreciate your content. It seems to be unique and interactive. The article has really peaks my interest alot. I am going to bookmark your site and keep checking for new information. Keep up the good work. One interesting aspect of design systmes is organisational issues. You can not force a large team to use your system, they have to feel it their own, and they have to contribute to it. We also had some challenges with tooling. There are many tools for collaboration out there, but we just couldn’t find a good solution for sharing and updating components. I hope this will change in the future.